If you own a website then we know your darkest fears. The fear of your website getting blacklisted will always top of your list. But what is it that you need to do to keep your website safe. Well here are a few things that you should avoid to ensure that your website does not get blacklisted by Search Engines. Cloaking: This is a method where content packed with keywords is shown to search engines while at the same time a totally different piece of content is shown to the users. It’s like a scam to rank higher on search engines but if you’re website gets caught in action; expect it to be blacklisted almost instantly. Paid links: This was one of the easiest ways to rank your website higher in search engines. But after the certain algorithm changes, this has become a drawback for most of the websites using this technique. In fact there have been reports of some popular websites being affected post search engines penalizing use of paid links. Piracy: Search Engines have become extremely stringent with regards to curbing piracy. If you put up any content that results in copyright infringement then you can have your website blacklisted for good. Take a look at the below screenshot for websites that have been taken off the Google Search pages due to complaints from DMCA [ Digital Millennium Copyright Act aims to criminalize unauthorized distribution of copyrighted content]. Keyword Stuffing: There is a thin line between the right amount of keywords and too many keywords. If you fall into the latter then your website will be considered as spam and yes you can expect your website to be blacklisted. Use it only when necessary and when it brings value to the content. Search engine algorithms have become smart enough to identify this. Duplicate/Low Quality content: Search engines are giving websites with relevant and high quality content higher page ranks so that the search results are as useful for the user as possible. Other websites with low quality content and duplicated content are either pushed to the back of the rankings or simply blacklisted. This is different from piracy as the content might not be copyright protected but it is still considered stealing someone else’s ideas. Violating Adsense policies: A maximum of three ad standard units are allowed on one webpage. Exceeding the threshold could result in Google considering your website as spam and will not only blacklist your website but also restrict your Adsense account [No more money for youL]. Automated content: There are many websites that rely on automated scripts and software to generate content. This is considered as spam by Search Engines and websites using this technique for content creation are generally blacklisted. Backlinks from spam/adult content websites: Backlinks are good for your website. Search Engines are however very serious about from where these backlinks are coming from. Reputed and trust worthy websites are fine but backlinks from spammy and adult content driven website is surely going to get your website blacklisted. Well after looking at all the pointers it is clear that the only way to top the search engine rankings is to simply do the right thing. So guys what do you think about this? Do leave a comment below if you have any other suggestions that is worth mentioning. Good quality content is very difficult to generate. There is already so much information about each subject on the internet that it becomes difficult to create unique content. Some take the wrong route by copying content from other peoples work and try to make it their own. Google calls this a plague which they want to eradicate completely. They have started this campaign by penalizing such offenders and dropping them to the bottom of the search rankings. But sometimes people can have similar ideas and there might be a possibility that you will unintentionally end up churning content which will be considered plagiarized by Google. To help ensure that you do not get penalized for no fault of yours we looked up some tools that you can use to verify your content for plagiarism. DupliChecker: This is a free tool that can be used to check a maximum of 1500 words at one go. It compares the text with the pages on the internet to find similar content. If there is any major similarity then it will share the links of that page for you to compare. There is a limit for the number of times you can use this tool in a day but a quick sign up on their website will allow you to use it as many times as you want. 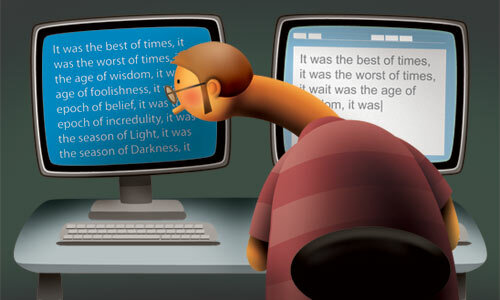 Plagiarisma: This tool can be used to check large columns of words for plagiarism. You would need to sign up to check the content against all pages in Google. You can only use it for a limited number of times in the day but if you need to verify more content then you would need to buy a paid membership with them. Hence use this tool wisely. You can also download browser extensions for Google Chrome and Mozilla Firefox to use this tool. Plagiarism Checker [from Small Seo Tools]: This is one of the simplest Plagiarism tools that you can get over the internet. Simply add text up to 3000 words and hit the button “Check for Plagiarism”. It will quickly check for documents over the internet and show you the text which has been plagiarized along with the link to the document where it was first written. It also gives you a percentage of unique content from the text that you have entered for checking. The best part about this tool is that it is free and you also don’t need to sign up to use the tool. Do share with us any other free tools to check for plagiarism that should have been mentioned here. Keywords are the terms which are relevant to the services or products offered on your website. They can comprise of a single word or a combination of two or three phrases. These terms play a very important role in determining your search engine rank and hence, are a crucial factor whilst designing the content of your website. So how do we go about deciding what kind of keywords should be a part of our website content? It’s very easy. The following four steps are the ultimate stairway to a healthy keyword-rich content, which would later help in optimization through SEO or SEM. The web is a plethora of keywords, but choosing the right ones is a task. Use appropriate keywords on your site and you’ll attract visitors who want to buy the products you offer. The more relevant the keywords, the more useful traffic you will attract and hence more business will come your way. Before creating the content for the website, you must definitely know what the structure of the site is going to be like. This forms the base of the kind of terms you would want on your site. The products and services that you are going to offer, the USP of these products, the brand name, etc. are the foundation stone of any content on a website. An ideal keyword research includes entering the competitor’s territory to find out what kind of keywords they are using. Just a mere visit to their websites and browsing through the pages and noting down important points should suffice. One should be aware of the kind of language and descriptions the competitors are indulging in. This helps in judging the kind of terms we must also use. External tools like the Google Keyword tool etc gives us statistics with regards to the local and global competition of a particular keyword. This data is extremely useful in analyzing the kind of competition in that avenue. After the initial research we are pretty equipped with the kind of keywords we would like to deal with. But it is practically impossible to incorporate all of them into our site. So what we would do is select the ones that appeal to our business the most. This could be done on the basis of the local / global competition (depends on your business targeting) , the products /services offered by your company, the structure of your website etc. A few hundred keywords would be decent enough for starters. Often, a list will contain more keywords than you could possibly target. It’s often necessary – and always wise – to use common sense when choosing keywords. Also it is important to think from a customer’s point of view. If a customer is looking for a particular thing, and he sees the exact same thing on our website, chances of his buying our product or service increases drastically. Usage of long tail keywords (phrases with 2-3 words) makes a lot of difference as it makes a customer feel that we actually have what he’s looking out for. So, prioritizing on these arenas is of utmost importance. Follow these basic steps and arrive at a convincingly decent keyword list. This will help in forming relevant content for the website which in future will fetch you good optimization opportunities. If you want your website to rank well, you would have to do both on page and off page search engine optimization and to monitor those results, you would need tools to see how well your optimization is working for your site. 1. Check link popularity: This will help you see how many websites are linking back to you from various search engines. The higher the number, the better your website will be ranked. 2. Page keyword analyzer: Research and analyze the keyword targeting from your web page for any keyword and urls and verify if your page is optimized for the given keyword. 3. Rank checker: Keyword rank checker tool to check your search engine position ranking for any keyword in the mayor search engines and get an advanced report including related keywords and spell check. 4. Keyword suggestion tool: Search engine optimization tool that will help you choose relevant and popular key terms related to your selected keyword. 5. Web traffic analyzer: Check your competitions web traffic. Though this is not 100% accurate but you will get a good idea. You do not need to contact Google to become part of their search engine. Google and other engines use spiders to index webpages, and only the search engine will decide what keywords are used and what rank you get. Make sure you Title Tag is relevant to your website as this is the most important tag for SEO in Google. The character limit of the title tag should be 160. Description is another important Meta tag and should not be used to stuff keywords. Remember search engines are much more intelligent and if you try to trick them, chances are that your website will be dropped. Meta Tags which were once used to identify keywords are now ignored by Google.